Writer C.O. 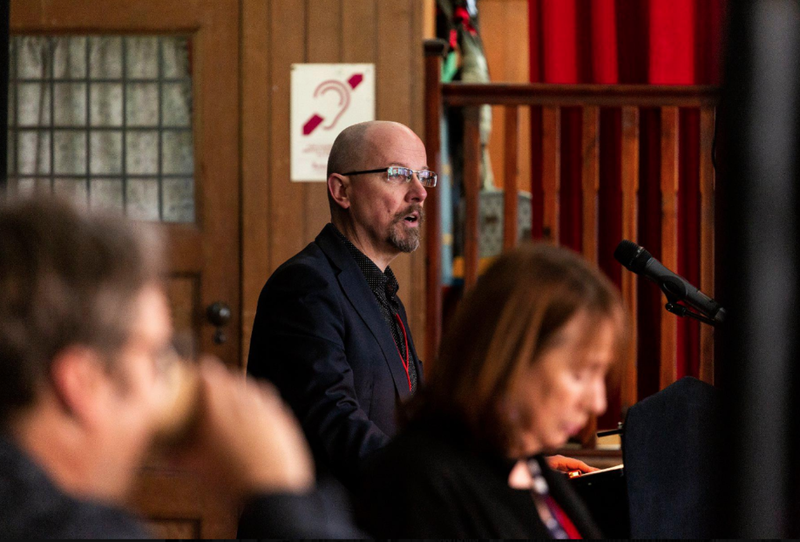 Vollmer won the Pitch Perfect competition at Bloody Scotland, Scotland’s international festival of crime writing, held each September in Stirling. Vollmer pitched SAFER TO BE FEARED, the first Cesare Aldo novel. A panel packed with agents, editors and publishing industry experts chose SAFER TO BE FEARED as the winning pitch, ahead of seven other projects by writers from America, Australia and across the UK. In their comments, the panel described the project as ‘something unique and creative … an exciting direction for crime fiction … a strong pitch which created an exciting world with huge series potential’. More than sixty writers applied to the competition, with eight chosen for the public event on Sunday September 23rd. Each writer had three minutes to pitch their project, before receiving feedback. The panel retired to consider before naming SAFER TO BE FEARED as winner, with Daniel Culver highly commended for his pitch, Dissecting the Wren. I’m pitching SAFER TO BE FEARED, my debut as a crime writer. It’s an historical thriller that takes a fresh approach to Renaissance Florence. I believe it will appeal to readers of Antonia Hodgson and Abir Mukherjee. SAFER TO BE FEARED introduces Cesare Aldo, the illegitimate son of a noble merchant and a female slave. Once a soldier of fortune, Aldo is now an officer for the Otto di Guardia, Florence’s most powerful criminal court. But Aldo believes far more in justice than in the rule of law. Why? Because he’s a gay man at a time & place where that sexuality makes him a criminal. The novel opens in the winter of 1536, in the hills north of Florence. Aldo defends Jewish moneylender Samuele Levi from a deadly attack by bandits. Yet this is no random incident. Aldo suspects the bandits were targeting Levi - but the moneylender refuses to say who wants him killed, or why. Aldo gets Levi safely back to Florence, but that same night the moneylender is stabbed to death in his own home after curfew. There are plenty of suspects: Levi’s estranged daughter, his ex-business partner, and all the rivals he undercut. But the murder of a moneylender has wider implications in a city driven by the merchant guilds. Soon Aldo is reporting directly to Duke Alessandro de’ Medici, the capricious ruler of Florence. He gives Aldo just four days to solve the case. Catch the killer by the feast of Epiphany - or suffer the consequences. At the same time, Aldo’s private life is being investigated by a bitter rival from within the Otto, searching for secrets to use against him. The closer Aldo gets to the truth, the more dangerous the case becomes. He discovers Levi was caught up in a conspiracy against Duke Alessandro - a conspiracy with its roots deep inside Palazzo Medici. Aldo suspects the moneylender was murdered for refusing to help the plotters - men who will stop at nothing to further their agenda. But if Duke Alessandro falls, all of Florence will be vulnerable to a republican revolt - or imperial invasion. The question now is: can Aldo stop the conspiracy before his own secrets destroy him? The magnificent, err, eight from Pitch Perfect 2018. Back from @BloodyScotland 2018 where I was one of eight finalists chosen from 60+ entries for Pitch Perfect. Each of us had three minutes on stage to pitch a crime fiction project to an audience - plus a panel of publishing industry people. Then the panel gives feedback. Following strong pitches by @DrForestIssac & @WhartonEileen I was third on deck. Breathe, breathe, breathe. Don't gabble. Leave room for listeners to absorb the info. Don't get distracted by a latecomer who decides to cross the hall, kicking what seems like every chair en route. Focus. Breathe. Punch the key words and phrases. Make eye contact. Mostly it's all from memory, but a print version is a useful crutch to avoid panic/babble. Breathe. Pause before final line. Return to chair, don't trip over, explode or melt. Phew. Now for the feedback. Feedback is an utter blur, can only recall two comments: don't put a comparison near top of my pitch [contradicting advice I've heard previously, but mileage does vary]; don't burden the book with historical detail at detriment of characterisation or plot progression [true]. So many cracking stories, so many strong pitches - last pitcher @DanielCulver11 has audience eating out of his hand, great presence and a very marketable USP for his book - certain Daniel had won, I relax as the panel retires to consider their verdict. I have not shamed myself. Panel chair @agentjenny gives some general comments about the high standard, then announces the winner's name. And it's me - or, more accurately, my pseudonym. It seems I have won #PitchPerfect @BloodyScotland 2018. I was utterly gobsmacked. And pleased. But mostly gobsmacked. Then it's time to get some feedback while I critically self-reflect on the first draft's strengths and weakness. I've been editing as I go along, about every 10k, so at a surface level it's quite tidy. But there's plenty of smooth out, enhance, and revise. Then it's query time. My most optimistic target is sending the book out by the end of March 2019, but June might be more realistic, depending on how much work the next draft needs. If there are major issues, that could slip to August/September 2019 - or later. Never rush to query, be sure it's ready. So there's a long journey still to come for SAFER TO BE FEARED but winning @BloodyScotland #PitchPerfect 2018 is a lovely boost of encouragement to keep going through the long, dark teatimes of the writing soul that lurk ahead.